In every profession, there are recognizable elements that reveal what type of work that people do. You recognize a firefighter by the red coat and boots, and a police officer by their badge and hat. In the same way, a chef’s uniform is lets you know that someone works in a professional kitchen. Have you ever wondered why this particular look has been designated as a chef’s uniform? Probably the most iconic element of the chef’s uniform is the coat. Usually white, the chef’s coat helps denote which individual in the kitchen is the person in charge. Legend has it that the white chef’s coat is so well known because of the dignity and rank that wearing a solid white coat expresses. It helps this person to stand out in the kitchen and is a mark of the professional training and education. In a practical sense, the chef’s coat also helps protect them from kitchen hazards, including splashes from hot liquids and burns. Similar to why you wear an apron in your kitchen at home, the chef’s apron provides added protection against the spills and splashes that often occur in the kitchen. Although the chef is wearing their coat, it doesn’t usually extend too far past the waist. From there, the apron helps protect their legs from kitchen hazards and helps to guard against stains to the coat itself. Aprons that have pockets are also great for storing utensils as chefs are sometimes busy moving from station to station in the kitchen. 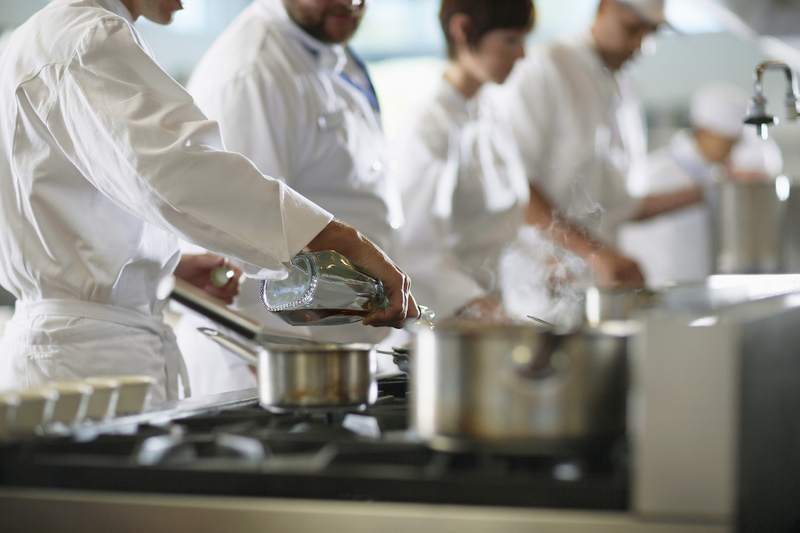 In every commercial kitchen, being hygienic and clean are two important practices that chefs and cooks around the globe have to keep in mind for the health and safety of everyone who dines at restaurants and cafeterias. In the same fashion that cooks wear hair nets to cover their hair, the chef’s hat also ensure that hair is held secure and away from the food. It also ensures that the chef’s vision always remains clear and unobstructed. Just like seeing a football player wear a towel around his neck when he’s not on the field, the chef’s neckerchief operates in the same way. It helps absorb the moisture from sweat to enhance comfort in hot kitchens.